PowerShell 3.0 brings lots of handy new network cmdlets – I say cmdlets, but to be precise they are functions, but with the familiar Verb-Noun pairing. Probably the easiest way to discover the version 3 cmdlets is to filter using the new PowerShell ISE panel. Just start typing a cmdlet and as you get to the ‘-‘ so you should see the ‘Commands’ add-In. You can see in the screenshot to the right how to select Modules, for example, NetTCPIP. Alternatively, you could try using the trusty old Get-Command technique. Here is an example of a useful new PowerShell 3.0 cmdlet called Show-Command. Its purpose is to research more about a cmdlet that we are interested in namely: Get-NetIPAddress. While I have chosen Get-NetIPAddress, you could experiment with any of these network cmdlets / functions. Note 2: See more about Show-Command. For some strange reason, the ‘Name’ property does not seem to produce any results, this is why I suggest that you use: ‘InterfaceAlias’. 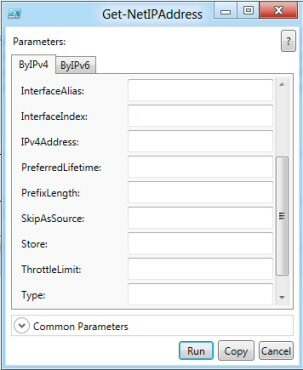 Get-NetIPAddress | FT InterfaceAlias, IPv4Address, RequestedState -auto. Note 4: There is also a sister command Set-NetIPAddress. 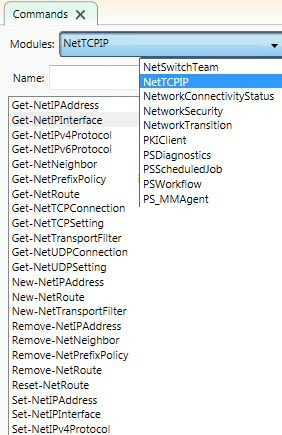 Here is different PowerShell Network command, with the GetNetIPInterface cmdlet you can extract information about the MACAddress and subnet mask. Note 6: If you need to change of these properties try the sister command Set-NetIPInterface. There are a group of PowerShell cmdlets which use the NetAdapter noun. Their job is mainly to enable or disable the NIC (Network Interface Connector), see more here on Disable-NetAdapter. Here are brief instructions to download and install PowerShell v 3.0. As an alternative to installing Windows 8, if you have Windows 7 with SP1 or Windows Server 2008 R2 SP1, then you can download the Community Technology Preview version, see here for PowerShell 3.0 CTP. Assuming you are at the Metro user interface, this is how to get started with Windows PowerShell ISE 3.0. From anywhere in the Metro UI, press the ‘p’ key. You should see a list of the programs and Apps. At this point you could right-click and ‘Pin’ the ‘Windows PowerShell ISE’. Incidentally, I prefer the GUI (ISE) version to the plain command line Windows PowerShell. PowerShell 3.0 brings lots of handy new network functions. The easiest best way to research these new cmdlets is to filter using the new PowerShell Command / Modules panel.